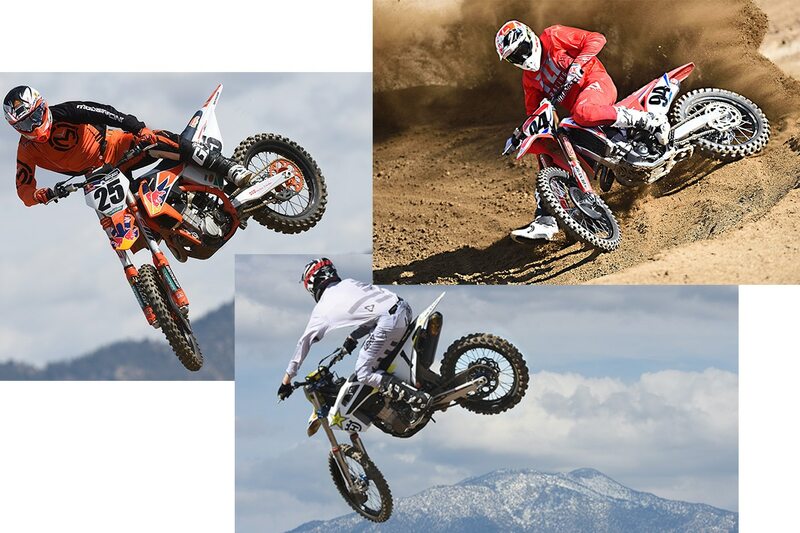 Three pro replicas are offered to the public this year: The Honda Works Edition, the Husqvarna Rockstar Edition and the KTM Factory Edition. All are hard to find and pricey. Still, we managed to get them all together this week. 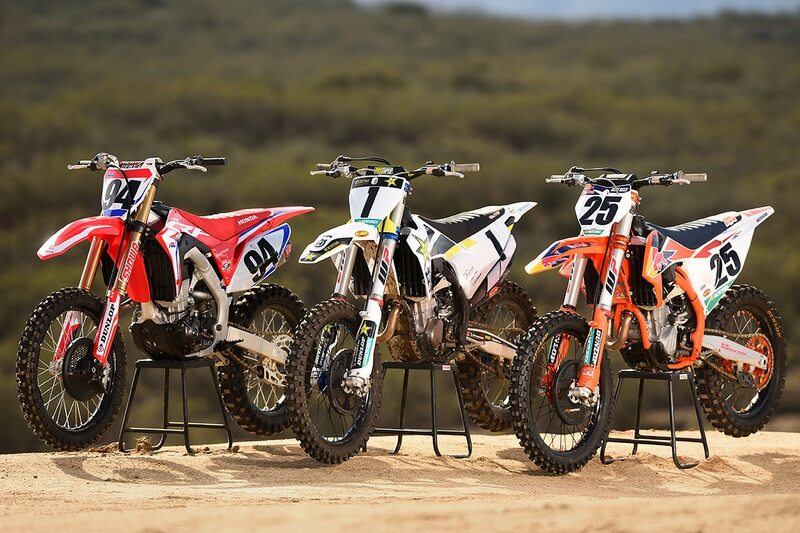 We know that these three bikes aren’t really duplicates of what Ken Roczen, Jason Anderson and Marvin Musquin ride. They don’t have works parts, they aren’t set up for Supercross and they aren’t assembled by the factory team. They’re still very special. All three of these bikes offer features and performance going way beyond sticker kits and numbers. We figured that was enough to justify a 450 shootout for special editions. The project is a work in progress, and here’s who it looks so far. 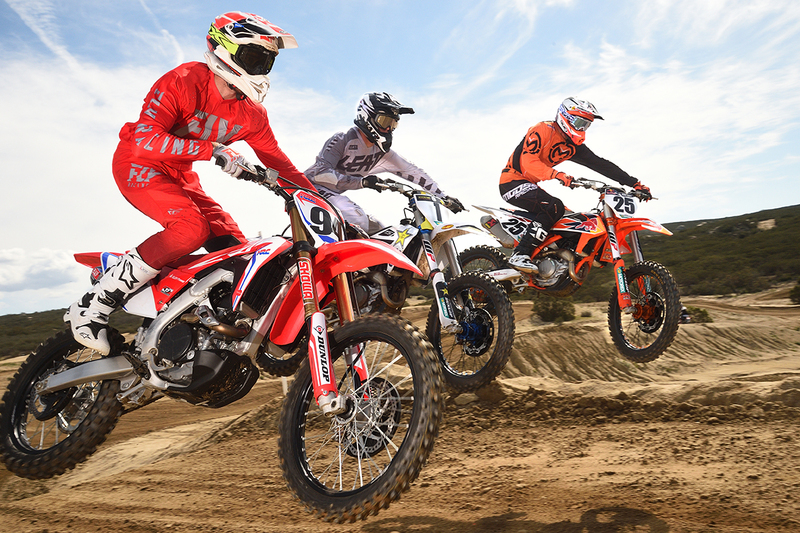 This isn’t just a revisit of the 2019 450 MX shootout. Like all of our shootouts, that was executed with the somewhat nebulous average rider in mind. We used a cross-section of test riders of various ages and skill levels, crunched the data and declared a winner. That bike was the 2019 Kawasaki KX450, which was a bike that everyone could love. This time, we’re changing the rules. These three bikes aren’t average. They represent the very best that each company can produce on an assembly line, short of building a real works bike. They’re elite bikes for elite riders. Accordingly, we only invited only pro level test riders to be a part of the shootout. 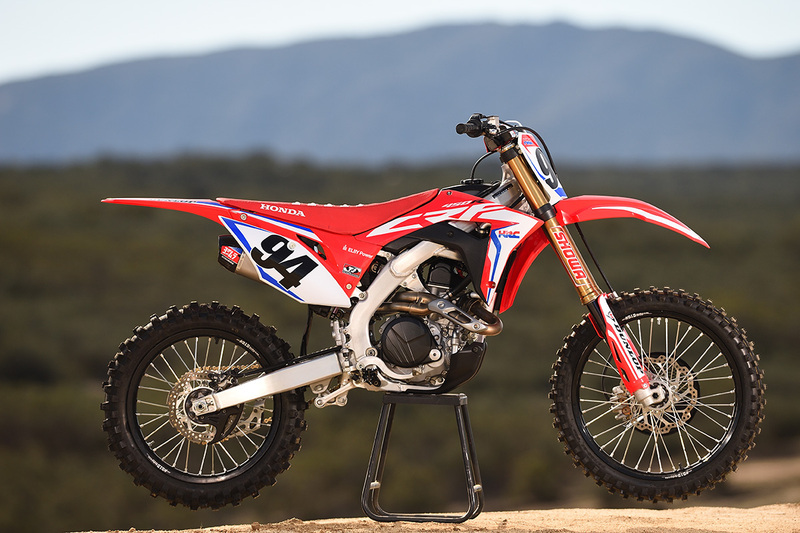 The Honda CRF450RWE sells for $11,499. That’s $220 more than the standard Honda 450. The Honda’s head received port work at the factory in Japan. The stock Honda twin canister mufflers were replaced with Yoshimura carbon-fiber slip-ons. And to go with those motor changes, the mapping was changed, as well. 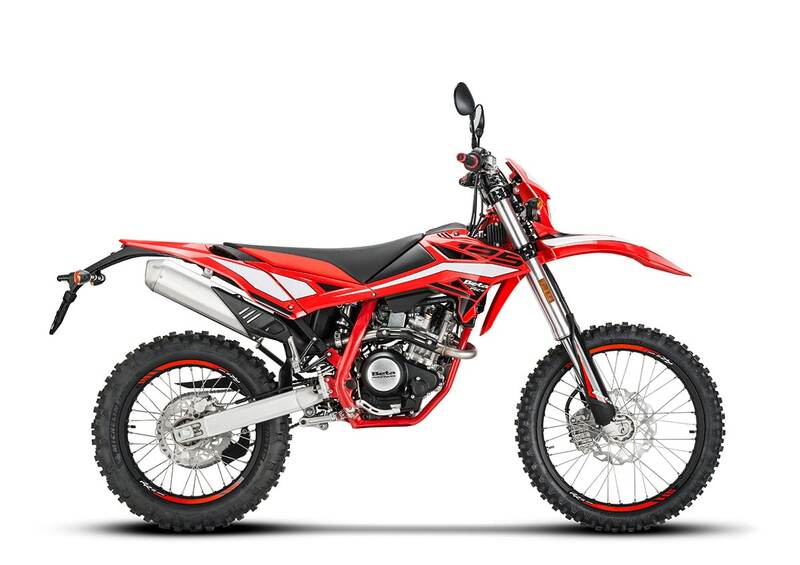 The standard version of the 2019 CRF450R got multi-level launch control, and those programs have been tweaked on the RWE, too. The Honda’s suspension received the most attention of all. The fork tubes and the shock shaft got a titanium nitride coating, and the internals got a Kashima coating. The rims are upgraded to DID LT-Xs, the chain is an RK Gold and the seat cover is a Throttle Jockey gripper. The Husqvarna FC450 Rockstar Edition will sell for $11,199. That’s $1200 more than the standard FC450. 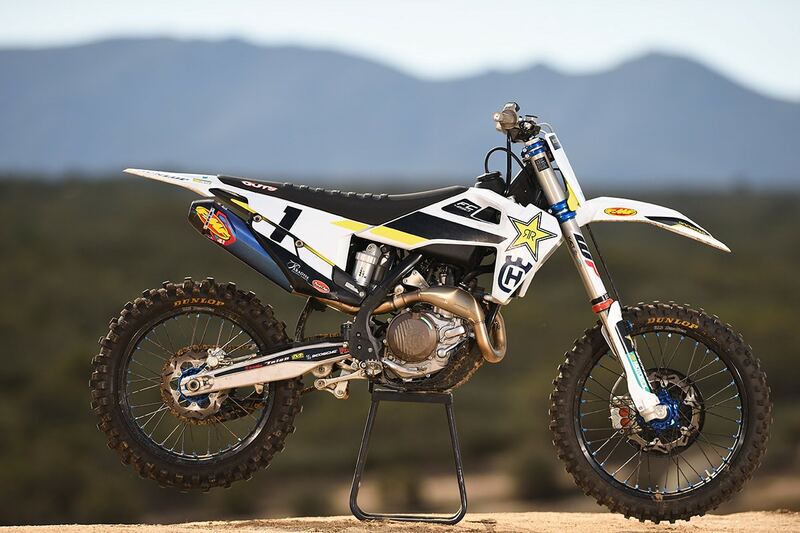 The Husky has team graphics and a big number one in honor of Jason Anderson’s 2018 Supercross championship. It also gets FMF Racing’s Factory 4.1 RCT. Probably even more significant is the CNC-machined triple clamp which has completely different flex characteristics compared to the stock clamp. The performance of any fork can be compromised by improper torquing of the pinch bolts, but the new clamps are machined more precisely to minimize this issue. The fork offset can also be altered with the new clamps. By removing and reversing the stem, the standard offset of 22mm can be changed to 20mm, and you don’t need a hydraulic press to do it. The bike has black D.I.D. DirtStar rims and blue anodized machined hubs. There’s a carbon fiber reinforced engine protector and a mechanical holeshot device, standard, and the ribbed seat cover has a Guts logo. The KTM 450SX-F Factory Edition sells for $11,099, $1200 more than the standard edition. 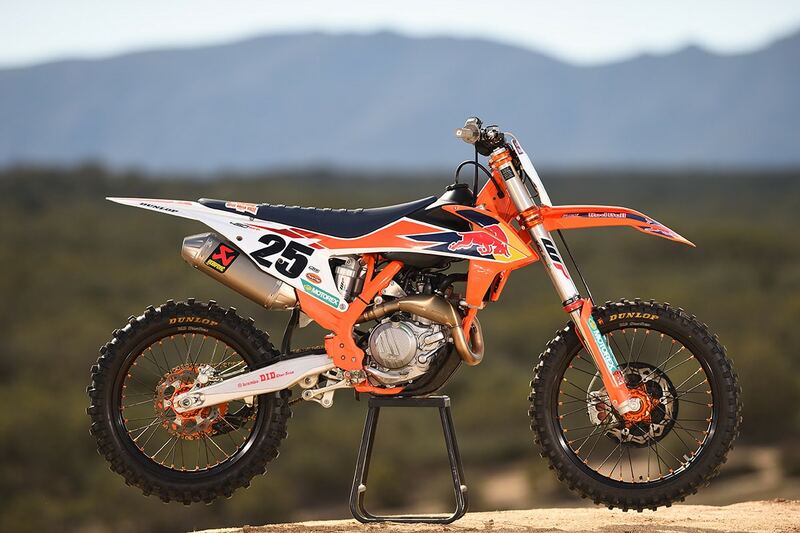 Since 2012 the KTM Factory Edition has been an annual tradition, even though there have been some years where it didn’t have new engine cases or a new frame. In those years, the Factory Edition is more about small upgrades, accessories and bling. This is one of those years. The engine and frame are the same as those on the standard model. The bike does get an Akrapovic titanium silencer and CNC machined triple clamps that are orange anodized, but otherwise the same as the Husqvarna’s. The WP AER 48 air fork has mechanical changes and has a higher recommended air pressure than the fork on the standard edition–10.9 bar versus 10.6 bar. KTM says that the flex character of the new triple clamp is different and the higher pressure just works better. The rims, engine cover, disc cover, and all the anodized bits and pieces give it the team look and the frame is orange. Here are some notes after our first day of side-by-side testing. All three make more power than their alter egos. In the case of the Husky, the difference is barely perceptible. You get a little more with the KTM, and you get a lot more with the Honda. It’s a rocket! The KTM and Husky turn well and have reasonable straight-line stability. They are defined, however, by their lack of weight. They both weigh 222 pounds without fuel. That’s downright incredible. The Honda is around 16 pounds heavier, and it can’t escape that fact. Some riders report that the Honda steers lightly, but the flipside to that is that it’s more nervous at speed. In the original shootout,the KTM and Husky were called out for having harsh front suspension. That wasn’t necessarily the case here. With minor internal changes, increased air pressure and the new triple clamps, both the KTM and the Husky were much improved over the standard models. 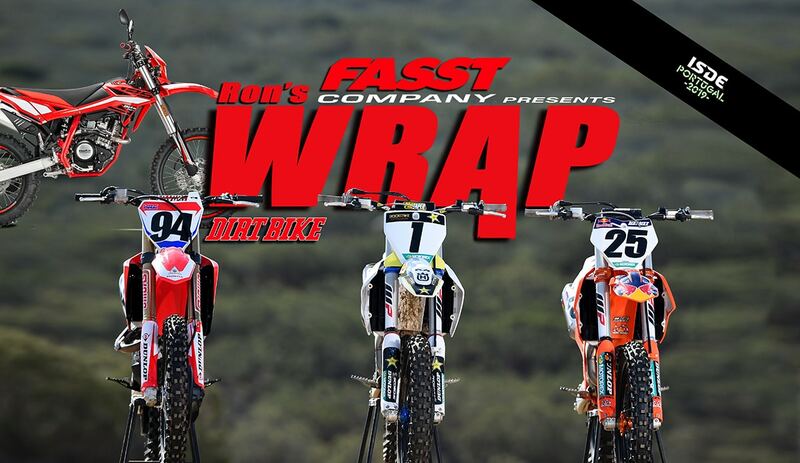 Most, but not all, of our pro experts rated the KTM and Husky fork higher than the Honda fork. The Honda’s valving and spring rate are the same as those of the standard model, but feel completely different because of the coatings. There’s much, much more to this comparison and we have more testing to do. The complete story will appear in the June, 2019 print edition of Dirt Bike. 2019 Beta 125RR-S dual-sport bike. 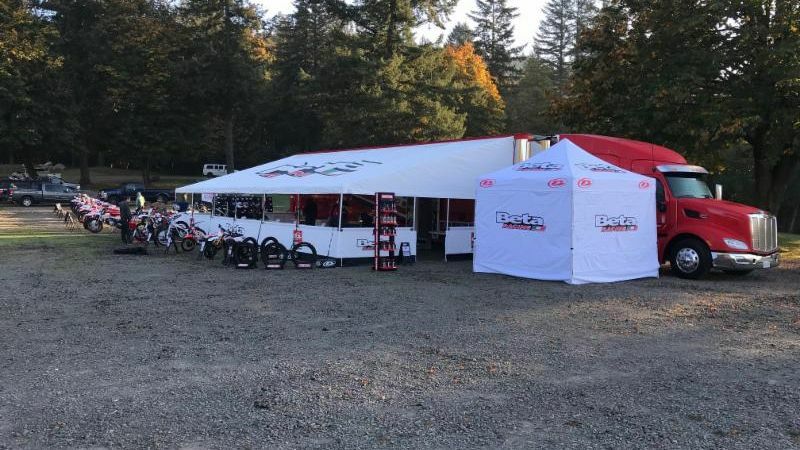 There are a few spots available at the next couple stops on the Beta Factory Demo tour, so if you have always wanted to experience the ride on a Beta, get out your gear and come join them for some good times. 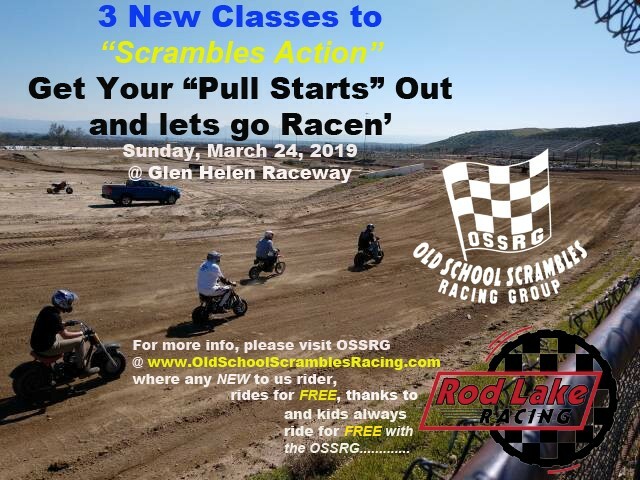 You will be able to ride over 25 current models including: RR-S Street-Legal Off Road, RR Offroad, and EVO Trials. Click HERE to go to the Beta website and get signed up! We’ve been hearing about this bike since the 2018 EICMA International Motorcycle show in Milan, and now it’s here. 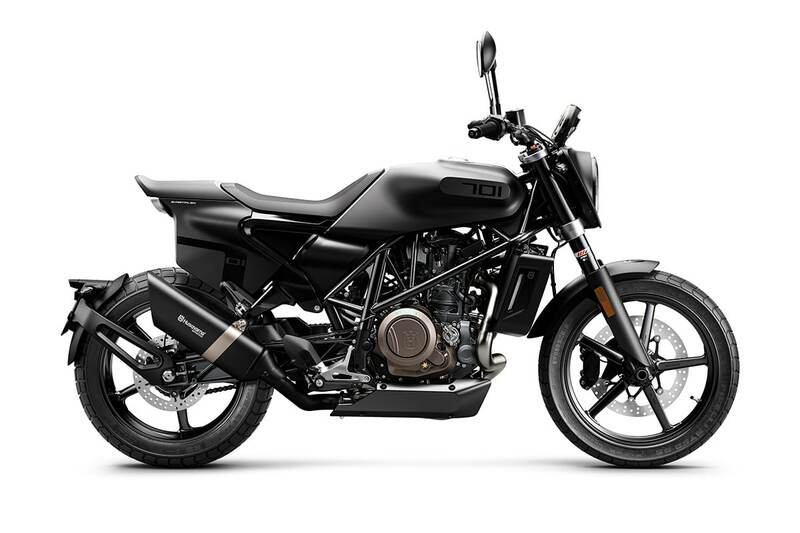 The Svartpilen 701 will be available to the North American market starting April of 2019. A flat-track inspired street explorer, the SVARTPILEN 701 is the latest addition to the VITPILEN and SVARTPILEN motorcycle range. Husqvarna Motorcycles now has what it calls the ‘Real Street’ model line-up.